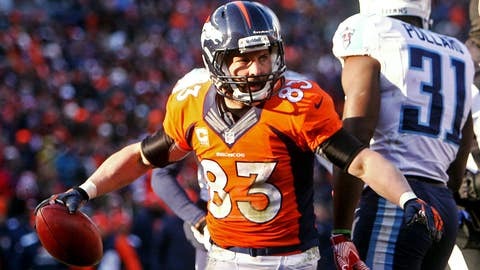 Wes Welker has 73 receptions for 778 yards and 10 touchdowns. The Denver Broncos will be without one of their most dynamic playmakers this Sunday against the Houston Texans. Wide receiver Wes Welker will not play because of concussion-like symptoms, FOX Sports NFL insider Jay Glazer said on Thursday’s FOX Football Daily. Welker, 32, sustained a concussion in Week 14 against the Tennessee Titans when he took a hit to the head on a play across the middle early in the game. He has not participated in practice since. It’s no secret that quarterback Peyton Manning isn’t the same without his go-to slot receiver. The Broncos struggled to convert on third down (2 of 9) against the Chargers and sixth-year wide receiver Andre Caldwell was Manning’s most targeted receiver. Ideally, the Broncos likely would shut Welker down until the playoffs, giving him more than a month to recover. But they are currently tied atop the AFC West with the Kansas City Chiefs (though Denver holds the tiebreaker), and the 11-3 record the teams share is best in the conference. So Denver still could drop all the way to the 5 seed. However, the Broncos do have a chance to wrap up the No. 1 overall seed this weekend, which would allow them to rest Welker.